Of course, if you've seen Anne of Green Gables the movie - you know that actress Megan Follows IS Anne. No one else could ever be. I had seen this Youtube clip of her first audition as Anne before but thought I would share it with you in case you hadn't. Perhaps even more interesting is this interview with Kevin Sullivan on some of the behind-the-scenes stories of casting Follows. I found this particular video fascinating and if you have a few minutes, I'd give it a watch. Did you know that Katherine Hepburn played a part in this movie?! How? Well, you'll have to watch to find out, won't you? Megan Follows played an autistic savant brilliantly in an obscure film, Under the Piano. Thank you for these clips. It makes me want to go back and rewatch all the movies. I didn't know Schuyler was Hepburn's niece! She's perfect as Diana. I enjoyed the second video -- I am glad they called Megan back again -- I can't picture anyone else in that role! I saw her pop up as a mom in an episode of Lie to Me last year (my husband likes that show -- I didn't but it's growing on me) -- and I wondered if we'd be seeing her in more roles soon. Hope so! Thanks so much for sharing those videos! I love the Anne movies, and it is so great to get a behind-the-scenes look at how it all came together! I wonder how Hepburn felt when her niece didn't get the Anne role. Without a doubt Megan Follows IS Anne Shirley. Now I want to watch the movie! Good thing I own it. ha!ha! I enjoyed this movie so much and am looking forward to enjoying it again sometime this month!! Great videos for us! Thanks for sharing them. I tend to forget You Tube exists, thought it is a fabulous resource for so many reasons. Anne is always darling. I noticed they said MEEgan intead of Meghan. Interesting! My daughter's name has been said and spelled a variety of ways, too. Thanks for sharing these, Carrie! Megan Follows is the only one who can play Anne, she is just perfect for that role! I can't even imagine going to see the play in Charlottetown, because it would not be Megan in the role of Anne, and it would just seem so weird! Megan is also in a really nice movie called "The Olden Days Coat" which is based on the book written by Margaret Laurence. I am hoping to find it so my kids can watch it too. Oh my goodness! It has been so long since I've watched A of GG, and now I need to watch it NOW!!! Watching Megan Follows' audition made me almost dissolve into a puddle of happiness. I agree with the previous posters--she is Anne! I am off to bed now, but I will come back and watch the other video later. She was born to be Anne, no doubt! :-) Seeing Diana (Schuyler Grant) as Anne was weird. I think she was perfect as Diana! Another observation: I didn't realize Rev. Allan and Alec King were played by the same actor. How did I miss that in my 1,000,000 viewings?!? Thanks so much for sharing this. I finally got around to checking out the videos. Very nice!! Thanks so much for sharing this clip. Anne of Green Gables with Megan Follows is probably my all time favortie movie. I can watch it over and over and now share it with my daughter too. 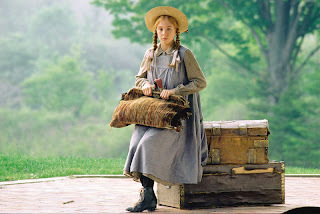 Megan Follows is awesome as Anne. Why don't I own this movie yet?? I've only read the book 20 times... (and I don't think that is an exaggeration)!